While much of the hype over Rolex's 2018 releases was reserved for the Pepsi GMT Master II, the Swiss watchmaker's Rainbow Cosmograph Daytona in Everose brought out the bling for watch collectors looking for a statement-making style piece with a whole lot of return on investment. 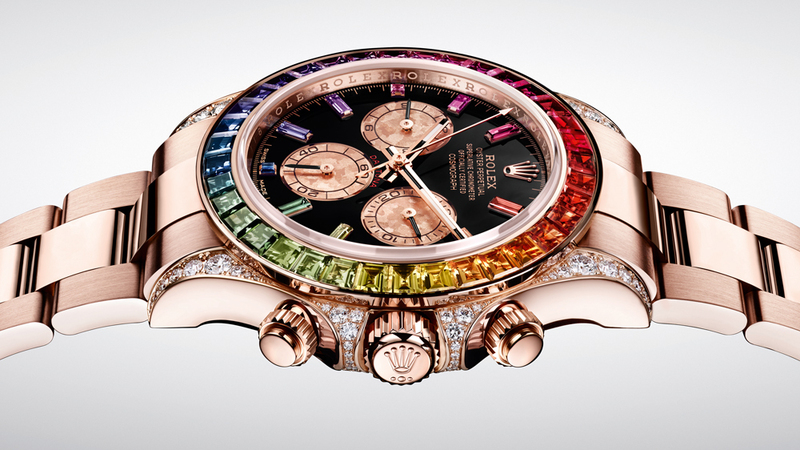 The Rainbow Daytona was first released in 2012 in both white and yellow gold in limited quantities and have since doubled their value. The price of the white gold version was originally around $90,000—last year Phillips sold that same watch for 181,250 CHF or $180,917 (according to exchange rates at the time of sale). Reason would suggest that the new Rainbow Cosmograph Daytona in Everose at $96,900, is a wise investment… if you can get your hands on one. Owning a Rainbow—surprise, surprise—isn't necessarily first come, first served. 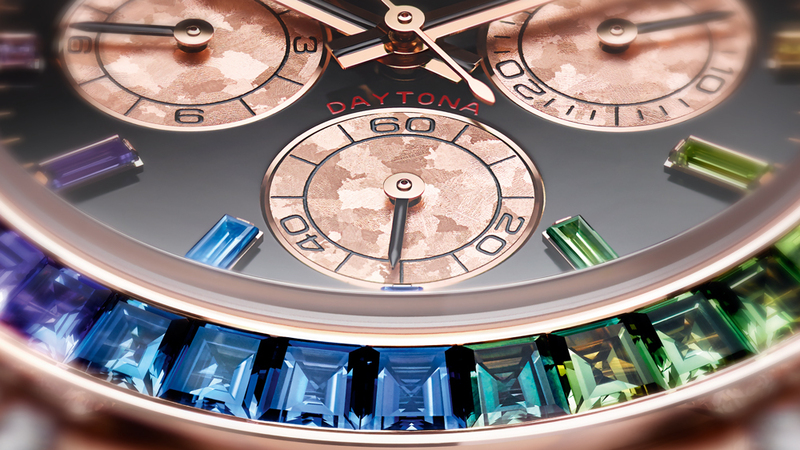 The Rainbow Daytona is not only a sought-after timepiece for collectors, but also among Hollywood A-listers, Pop icons, and entertainment moguls. Despite its 40 mm size, the timepiece is popular among both male and female clients, upping its "hard to get" factor. First dibs on the Rainbow Daytona will likely go to those that already own one. The limited production quantities of this timepiece and its predecessors owes itself to the difficulty in finding stones up to par with Rolex's quality standards for this particular kind of setting. 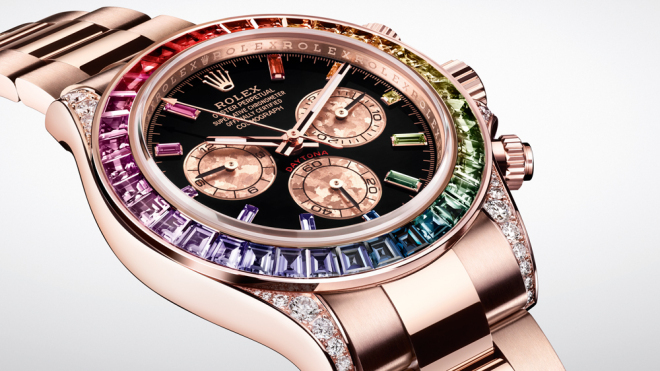 For those that do already own a ROYGBIV-gemmed Rolex Daytona, the 18-karat Everose material will be a lure not only for aesthetics, but also for its patented Rolex material. The watchmaker's pink gold alloy, known as Everose, contains 76 percent gold and a little more than 2 percent platinum. 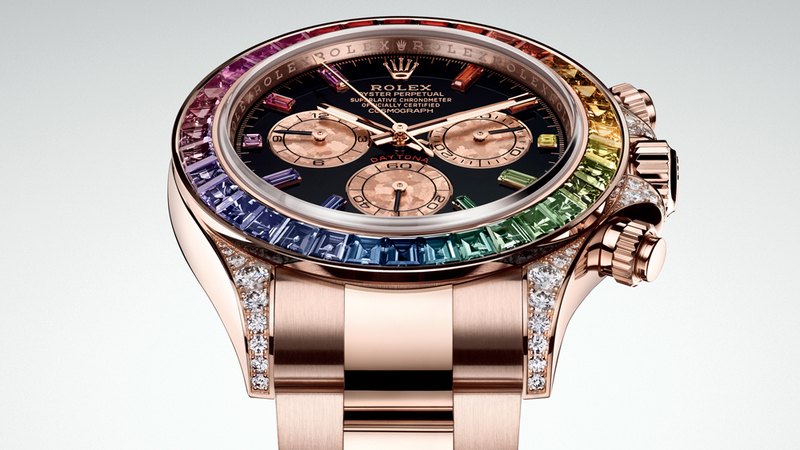 The copper contained in the material, is held in by the platinum, so that the timepiece maintains its particularly unique color throughout time, complementing its 36 baguette-cut sapphires in Rainbow gradation, 11 baguette-cut sapphire hour markers, and 56 brilliant-cut diamonds.